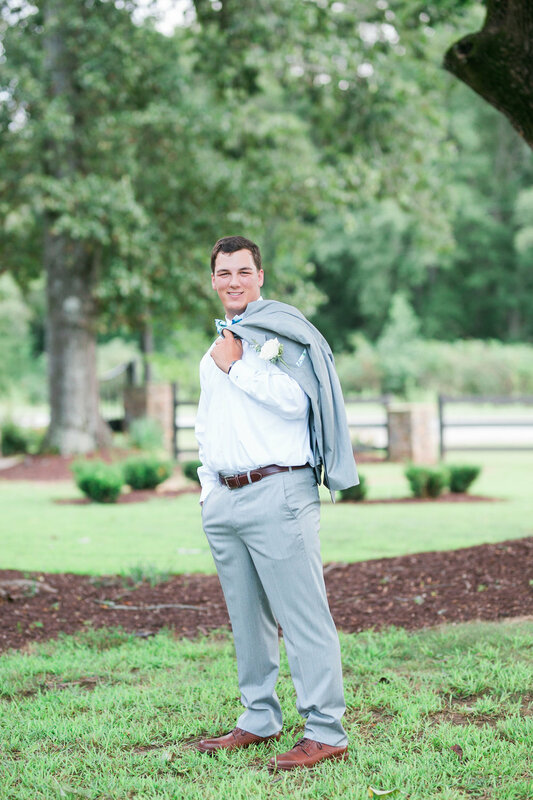 August may not be the most popular month to get married in Georgia but Haley and Trevor’s August 2018 wedding at Pepper Sprout Barn was as close to perfection as it gets, making August weddings not seem like such a bad idea after all! All photos in this blog post are by the amazingly talented Mandee Matthews Photography. 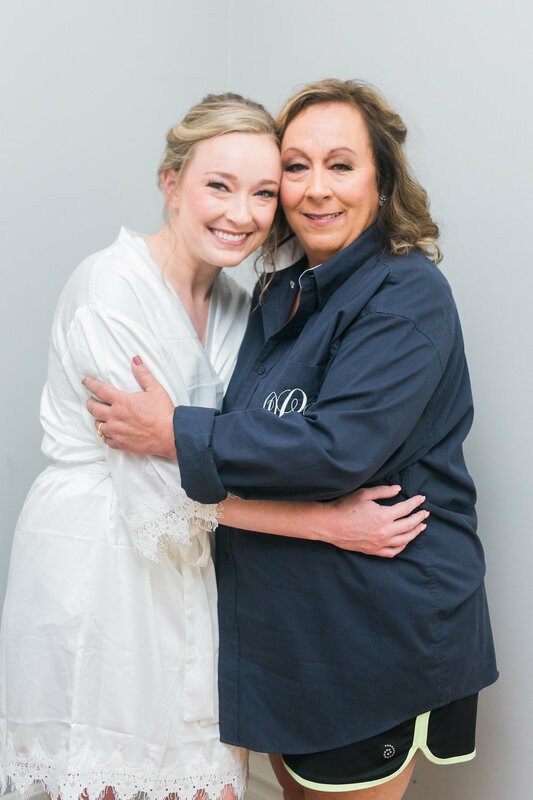 Haley came to us because her mom attended her friend/co-worker’s daughter’s wedding, so Diane, Haley’s mom, knew what it was like to be a guest at a Pepper Sprout Barn wedding. Diane reached out, she and Haley toured and there was an instant connection! 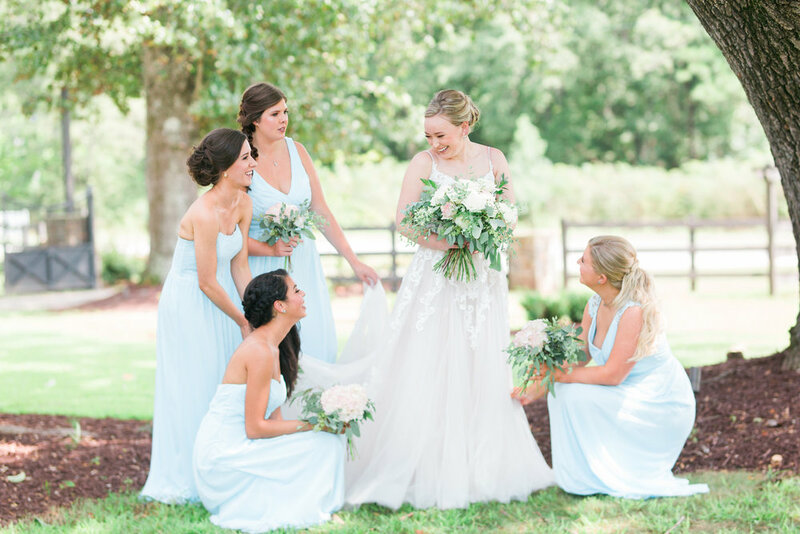 We laughed and reminisced about Brittany’s wedding and the planning began. We love when we get to connect with friends and family of our previous couples, it always makes for the best relationships. 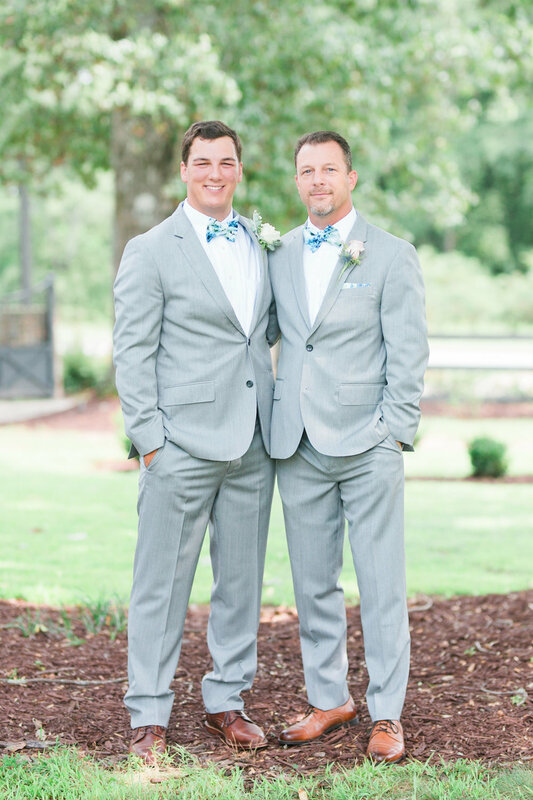 All pictures are credited to Mandee Matthews Photography. August Wedding at Pepper Sprout Barn. That aside, let’s talk details. 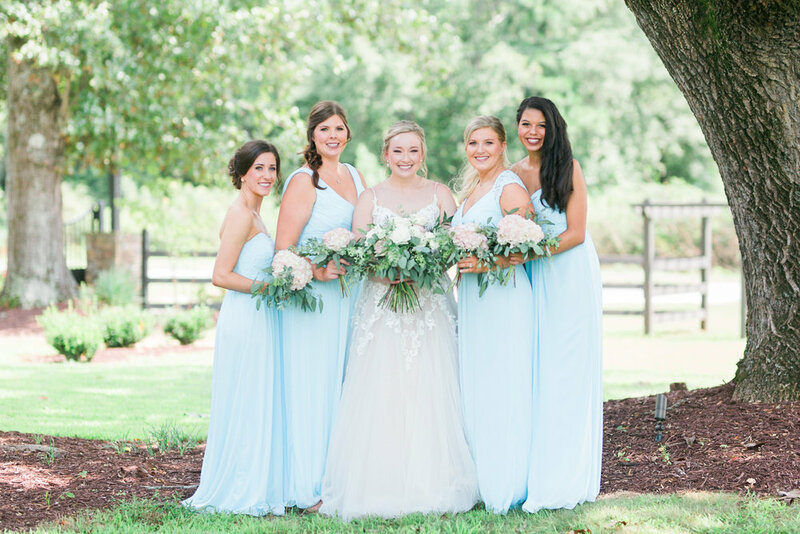 Haley and Trevor’s soft blue and light gray palette added a soft, airy feel to this beautiful summer wedding day. 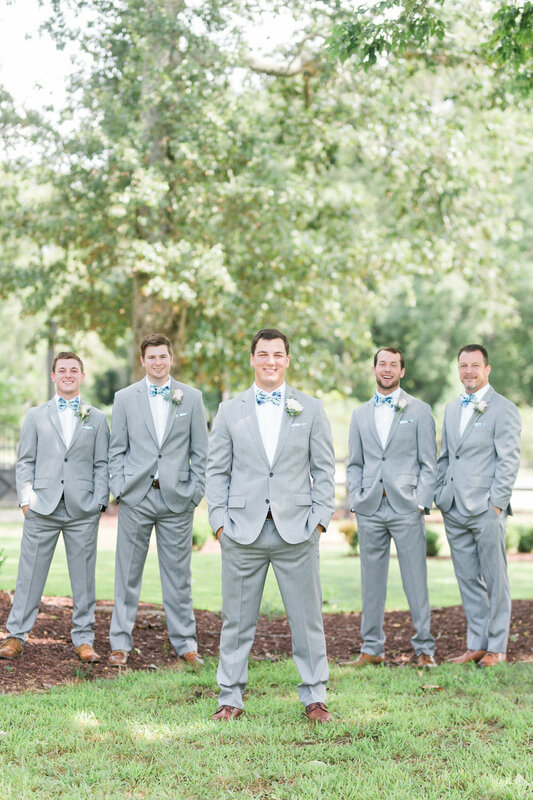 The bridesmaids were dressed in light blue dresses in silhouettes that best flattered them and the guys looked sharp in their gray suits and floral bow-ties. It was a great look! Haley was truly the most beautiful bride. Her blue eyes sparkled, her smile was radiant and her dress was to die for. The plunging sweetheart neckline, the gorgeous lace detail and soft, flowing chiffon top layer coordinated perfectly with the style of her wedding. It fit her and her personality perfectly. The most perfect bride. Mandee Matthews Photography. August Wedding at Pepper Sprout Barn. Her hair & makeup, done by Perfectly Pinned Up, was magazine worthy. 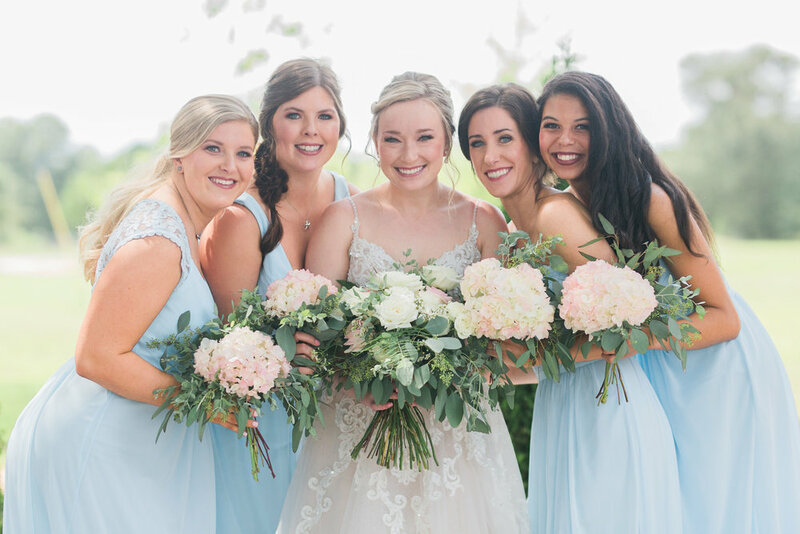 Samantha & Kelsey created an elegant up-do hairstyle and her makeup was the perfect blend of glamorous and natural, highlighting Haley’s beautiful features. Let’s discuss Haley and Trevor for a moment…these two are a match made in heaven. They are so sweet, sincere and supportive with one another. Trevor attended many of the meetings and encouraged Haley in all her ideas and visions. They laughed constantly and were so endearing towards each other. They are the epitome of relationship goals and it was so evident to all who witnessed their vows that their love was the real thing. 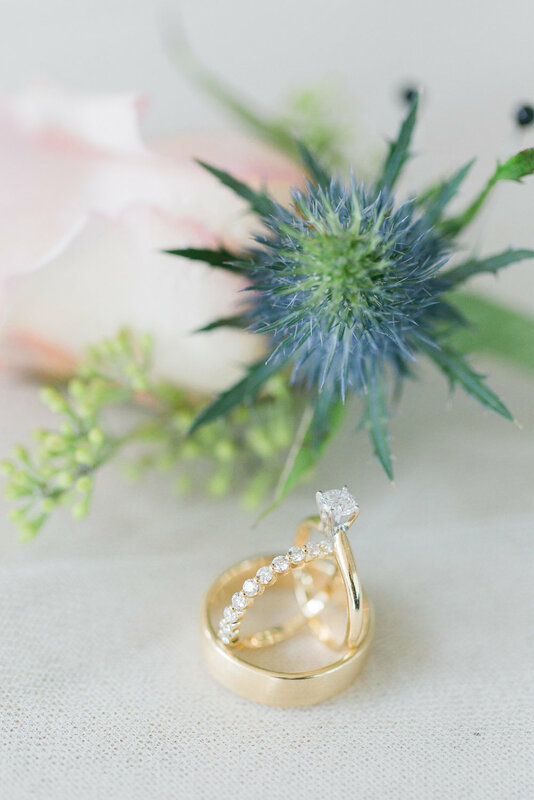 Haley & Trevor opted for a first look so the images below are from that touching moment. 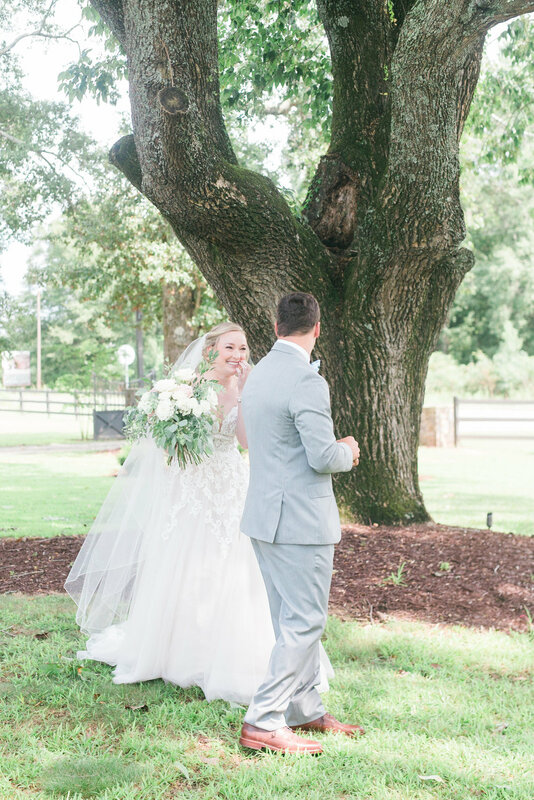 We love first looks—they make the best pictures! Speaking of love and vows, their outside wedding almost didn’t happen outside, thanks to Mother Nature. In classic summer weather in Georgia, pop-up storms started and were circling the area. The winds picked up, the clouds got darker and we all held our breath hoping the impending storm would stay away…and it did! Thank goodness because Haley & Trevor’s ceremony setup was magical. With a backdrop of our neighboring pasture, they combined our antique pews with a wooden cross adorned in florals from Cyndi with Twigs, Leaves & Flowers and their own signage with greenery. It was truly perfection! 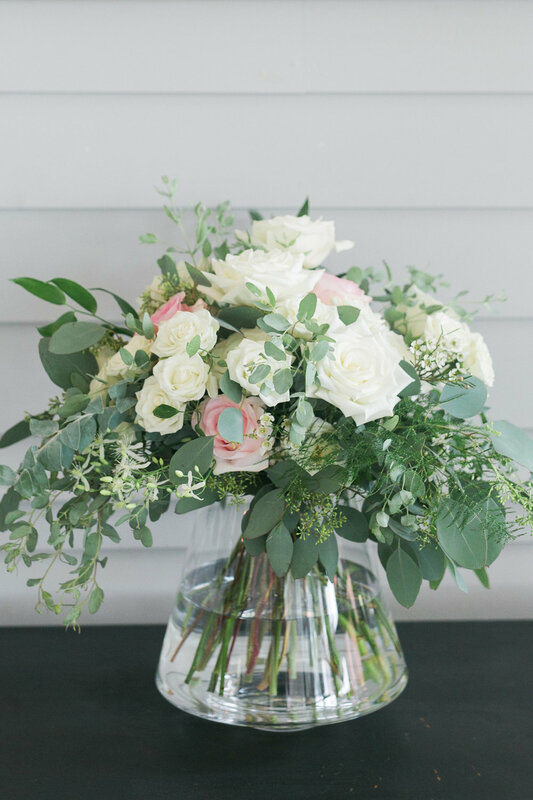 The newlyweds’ reception continued the feel of romance and soft, pretty details. The soft blue linens were decorated with a combination of dramatic floral centerpieces created by Cyndi, mixed with gold votives, glass vases and personal photos of the couple. Cyndi added her talents to our decor to create a beautiful backdrop to the celebration. One of the highlights to the wedding was the choreographed dance of the groom and his mother—it was awesome! Everyone was thrilled and honored to celebrate with these two lovebirds and the guests danced the night away. The music was loud and fun thanks to Steve Allen from Atlanta Mobile Sounds and it was a party no one will soon forget. Side note: Haley and her mother-in-law have such a great relationship. Haley and Diane invited Michelle to be a part of the meetings and planning, bringing them closer together through the process. Now that’s a great way to start blending two families! Other fun features of the night included a photo booth by Strike a Pose Atlanta and delicious food by Ooh La La Catering. The classic white cake from Make it Cake was adorned in flowers and greenery, all topped with a personalized cake topper. Cake by Make it Cake. pc: Mandee Matthews Photography. August Wedding at Pepper Sprout Barn. As the night came to a close, a sparkler send-off was the exit of choice as these two jetted off to their honeymoon in Jamaica. They left in style in a fire red 1970 Chevrolet pickup truck. The best ending to a perfect night! 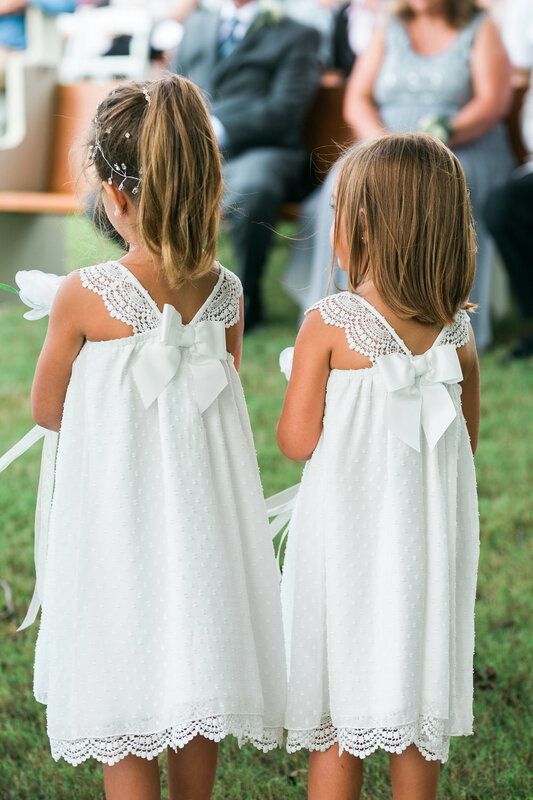 Every detail of their day was photo-worthy and we are so glad that they chose Mandee Matthews as their photographer. We are still in awe of their gallery and are so thankful for Mandee’s generosity in sharing the pictures. If you follow us on social media or noticed our website’s cover photo, you know we can’t get enough of Haley and Trevor’s day! 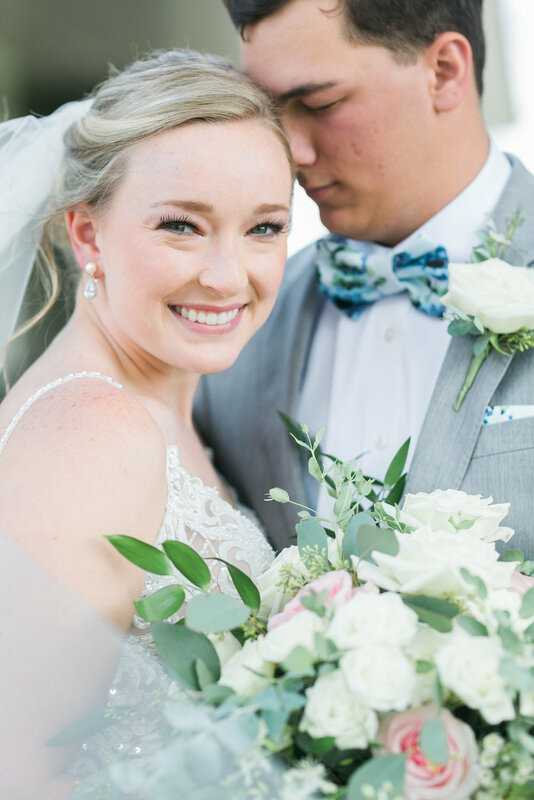 Connor Price did their wedding day videography and we are so thankful we can relive this day with a click of a button. You should check it out! Looking for wedding inspiration? 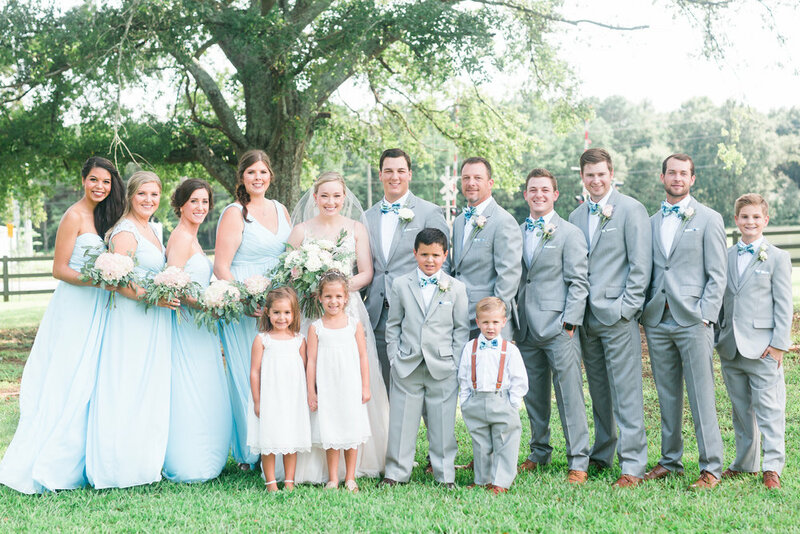 Haley and Trevor’s wedding is the ideal wedding to jumpstart your own planning! 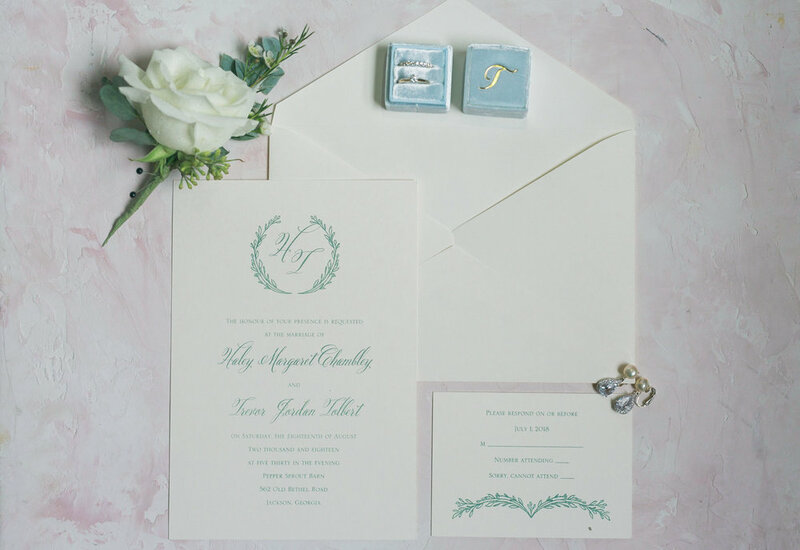 Personal signage, gorgeous florals, classic & elegant wedding attire and all the elements for a fun party! What’s the detail of your wedding that you are most looking forward to creating? Tell us below so we can be inspired!